Capitalism and Christianity, American Style is William E. Connolly's stirring call for the democratic left to counter the conservative stranglehold over American religious and economic culture in order to put egalitarianism and ecological integrity on the political agenda. An eminent political theorist known for his work on identity, secularism, and pluralism, Connolly charts the path of the "evangelical-capitalist resonance machine," source of a bellicose ethos reverberating through contemporary institutional life. He argues that the vengeful vision of the Second Coming motivating a segment of the evangelical right resonates with the ethos of greed animating the cowboy sector of American capitalism. The resulting evangelical-capitalist ethos finds expression in church pulpits, Fox News reports, the best-selling Left Behind novels, consumption practices, investment priorities, and state policies. These practices resonate together to diminish diversity, forestall responsibility to future generations, ignore urban poverty, and support a system of extensive economic inequality. Connolly describes how the evangelical-capitalist machine works, how its themes resound across class lines, and how it infiltrates numerous aspects of American life. Proposing changes in sensibility and strategy to challenge this machine, Connolly contends that the liberal distinction between secular public and religious private life must be reworked. Traditional notions of unity or solidarity must be translated into drives to forge provisional assemblages comprised of multiple constituencies and creeds. The left must also learn from the political right how power is infused into everyday institutions such as the media, schools, churches, consumption practices, corporations, and neighborhoods. Connolly explores the potential of a "tragic vision" to contest the current politics of existential resentment and political hubris, explores potential lines of connection between it and theistic faiths that break with the evangelical right, and charts the possibility of forging an "eco-egalitarian" economy. 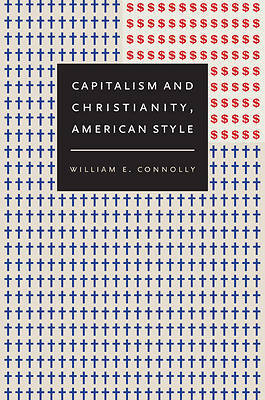 Capitalism and Christianity, American Style is William E. Connolly's most urgent work to date.